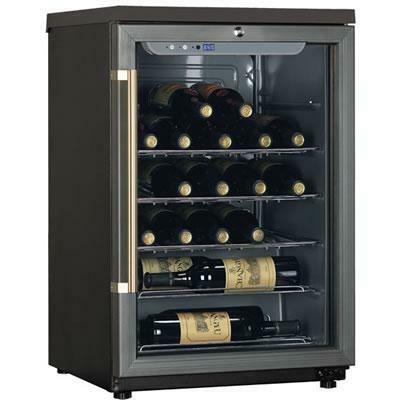 This 24-bottle capacity free-standing wine cellar keeps your favorites wines at an optimum temperature with automatic settings for reds and whites. It features an adjustable electronic temperature control with LED display, a double pane tinted glass door, and a compressor cooling system. 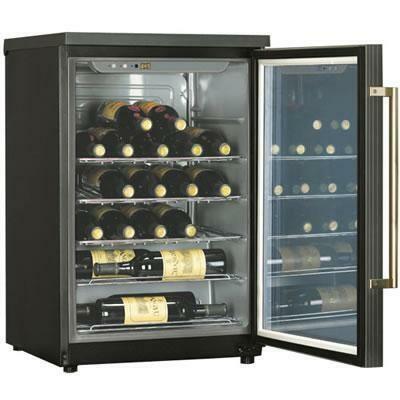 The three full-depth chrome storage racks and two half-depth racks in this modern graphite-colored model help you store your bottles in style, while a security lock and key safeguards them. This unit is quiet-operating and provides a vibration-safe environment for your collection. Total 2.8 Cu. Ft. / 0.08 cu. m.
Additional Information Rear ventilation. Cooling method: Compressor. Temperature Setting Range (°F): Zone 1 43-65. Chrome Wire storage racks. UL, CUL safety approvals. CEC approval. UV-Grey Blue door glass.